Editor’s note: Emily is a C&IS Peer Educator alumna. You can read her previous post, Adventures in Teaching Abroad, to get all the background info about why she and her partner decided to spend a year in South Korea teaching. Here is the rest of her advice about getting started with the teaching abroad process. The entire process of becoming a qualified candidate, interviewing with a recruiter, lining up a job, and completing all the paperwork took about 6 months. Fees can be a red flag. Keep in mind that we didn’t pay a cent to submit an application, to interview, to apply for work, or to sign a contract. There are recruiters, like Don (ESL Joblink), that are paid by schools to find quality candidates to teach abroad. Our largest expense was mailing paperwork and the processing fees for required documents such as FBI background checks. Ask others. Begin talking about your desire to teach abroad in casual conversations. Oftentimes people will bring up a relative or friend or reveal that they had an experience teaching overseas. This is a great opportunity to be assertive. In several instances, Danny contacted strangers on Facebook after having a conversation with a mutual acquaintance. For us this resulted in Skype sessions and informational interviews at coffee shops. Each time we asked if they went through a recruiter or organization. We found this to be the most helpful way of finding a reputable agency. This includes getting an FBI background check, a passport, and work visas. Our recruiter Don guided us through this process. He kept track of deadlines and was available to answer questions. For questions he couldn’t answer, I was often able to find an answer online. Danny and I were very anxious to sign our contract because we had read horror stories of teachers stuck in terrible contracts. We asked for a few days to make a final decision and read our contract carefully, we had our families and friends read it and we sent several messages with questions to our prospective employers to clarify. My biggest piece of advice: take your time making this decision. Don’t become too excited or desperate, or you might become stuck in a difficult situation that could become increasing complex negotiating with language and cultural barriers. You will need to order currency and start packing. Packing for a year away from home can be daunting. I started in phases and relied on packing lists I found on countless travel blogs. Keep in mind that you need less than you think you do. Almost everything you can buy in America you can buy in Korea. If you have even a little doubt, don’t pack it. You will accumulate things in Korea and it will become expensive to move your things back home. If you are planning on teaching in Korea, focus on a professional wardrobe. Koreans are dressed to impress, all day, every day. After making time to visit and say goodbye to your friends and family, it’s time to go! The big leap is exhausting and terrifying at first, but it will be one of the best years of your life. Emily with a few of her students. Hello! I’m Emily, a previous Peer Educator at UMD Career & Internship Services. I’m writing as a guest blogger today to share information about teaching abroad. Currently I live in Ulsan, South Korea with my boyfriend and fellow UMD alum, Danny. We teach at a hogwon, which is a private school that operates during after school hours. So, how did we get here? After graduating UMD with art degrees (BFA Photography and BA Theatre) Danny and I have both jumped from job to job trying to find something we loved. I landed for a brief period of time at the Minnesota Children’s Museum in St. Paul, where I met a co-worker who had taught English in South Korea and Brazil. Both of her experiences seemed extraordinary and I asked for the name of her recruiter. After some follow up research, Danny and I submitted an application to a recruiting agency based out of Minneapolis called ESL Joblink. The more we sought out past and present ESL teachers in our own workplace and communities we found more people who had gone through ESL Joblink. All of them had or were currently having a rewarding experience teaching abroad at reputable schools. Danny and I soon met and interviewed with our recruiter, Don, began an online TEFL (Teaching English as a Foreign Language) class and started our visa paperwork. Our recruiter was able to connect us with the director of a private school in Ulsan, South Korea and after a phone interview we were hired, as a couple, to teach abroad. Since coming to South Korea we have been able to explore parts of Japan, Thailand, and Cambodia. By the end of our year, we will have traveled to Vietnam, Taiwan, Morocco, Belgium, and the Netherlands. Depending on how you plan your trips, traveling can be extremely affordable in Southeastern Asia. In Cambodia, for example, a large dinner can cost anywhere between 2-5 dollars and your accommodations can be just as cheap. If you want to see the world, teaching abroad makes traveling easier and affordable. Traveling is my favorite part of teaching abroad, but I cannot stress enough that you have to enjoy working with kids and have an interest in teaching. I teach long and difficult hours everyday and I find it equal parts rewarding and exhausting. Nothing in my life has been as challenging as being an ESL teacher. Many of my students are overworked and tired (some go to school from 8 am to 10 pm, even on Saturday and Sunday) and they deserve the best teachers to energize and engage them in learning. Unfortunately, foreign teachers in South Korea have a bad reputation for not actually caring about their jobs, but for being backpackers. I can’t imagine enjoying this experience at all if I were only going through the motions, waiting for my travel breaks. This job is ninety percent teaching kids, so if you don’t have experience in teaching, or working with kids or saying, “Sit down, stop that, listen carefully, no hitting, indoor voice, hands to yourself” like a broken record, try it in the United States first before you hop over the pond. Minimal research done online will show you that South Korea is one of the best locations to teach abroad. After signing our contract, our airfare was paid for, our housing provided, and a few household items/ utilities were given to us for free. Since our accommodations are located close to work, we spend little on transportation, which means at the end of the week our biggest expense (besides our student loans) is groceries. In Korea, you will be paid well and, without airfare and rent payments, you can save up a sizeable amount that you can then use for traveling or for other things. Even with student loans, it is completely possible to save up to $1,000 dollars a month. Stay tuned for part 2 where I talk more in-depth about how you secure a teaching abroad position. All photos are by Emily. Editor’s Note: We’re welcoming Emily back for a guest post! Check out all of her previous work on the blog from when she was a student. Perspective is everything, because how you view yourself in this stage of life is very important. It can be intimidating to apply for professional positions. There are moments of self-doubt when you contemplate the size, talent and experience of the candidate pool. Sometimes you feel like a kid that isn’t fooling anyone. But you have to believe that you have something unique to offer, because you do. If you consider yourself chronically under qualified for every position that you’re interested in, you might need to pursue more education and training or you might need to shift your perspective and really consider your strengths. You have to have confidence that you are an excellent candidate. “Adventure” is a positive, exciting word, but real adventures are full of highs and lows. Moments of adventure can be as terrifying as being faced with a dragon. Moments of adventure can be as lonely as wandering through a desert or as uncertain as drifting through outer space. And that is what adventures are. The best stories are not full of characters who are living comfortably in their circumstances. The same goes for our lives. The best stories are about when we are met with unexpected challenges that seem too large to defeat and we overcome. When you are experiencing your own lows, know that you are experiencing the mountains and valleys of your adventure. With hard work and determination, there will be a time when you’ll be standing on the mountain enjoying the view. Format all your attachments as PDFs and send yourself an email before you send them to any potential employer. That way you can make sure the attachments open and are still formatted the way you’d like. Sometimes you should physically go to the places you are applying. Once I was asked in an interview, “Have you ever visited before?” and I had to say no. Physically go and ask companies if they are hiring. After a face-to-face conversation, my friend was invited to do an on-the-spot interview by a business owner and was offered the position I had applied for online. In cover letters people often explain how their skills and experience match the job qualifications listed. To set yourself apart, make sure to explain how the values of the company match your values. If you appreciate the “why” of what they are doing and specifically “how” they are doing it, you will be a more attractive candidate. Ask for three Letters of Recommendation before you graduate and ask for one before or immediately after you leave a position. Do this while their memory of your work is fresh in their minds. Going to past employers after several years of no longer being their employee and asking for a recommendation is far more awkward than sending them a message asking them if you can continue to use their letter. If you don’t want to ask for a full-fledged letter of recommendation, at least ask for a recommendation on LinkedIn. Say “thank you” to everyone that helps you along the way. In entry-level positions especially, find out if there is another position in the company that you might be interested in. Seek out opportunities where you can ask your coworkers about what they do, embrace opportunities to learn a new skill on the job and find ways to go above and beyond in your current position. Keep applying, ask for feedback and find a healthy life balance with Netflix. Post-College Uncertainty? Oh Yeah, it’s Real. Hey everybody! In the next few weeks I’ll be graduating and heading out into the “real world”. 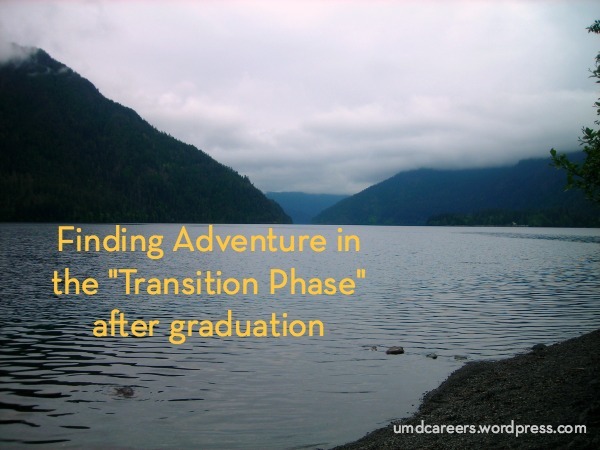 It’s been a truly wonderful experience to work for Career and Internship Services and I am going to miss writing these blog posts. I am also looking forward to the next chapter in my life in Minneapolis. It will be bittersweet to be done with school and I appreciate this time to reflect. And like many of my fellow graduates, I realize I’ve changed and grown and I have become an entirely different person in these last four years. Be kind to your body, mind, and spirit and generally be good to yourself. Call or write to your grandparents. Thank janitors, bus drivers, cashiers, and food service workers. Take the time to taste your food, even when you’re running late. Figure out what makes you feel human and not like a hamster on a wheel, whether it be sipping wine in a bubble bath or skipping a class to go for a walk. Whenever you feel like life is running over you, reclaim your voice and redefine it for yourself. Read the posters in the hallways and try to attend everything that interests you. Try something quirky and new just to test your bravery, like salsa dancing or scuba diving. After a while, you loose your motivation to jump hoops just because it you’ve been told that lead you to future rewards. Try finding meaning in your assignments by making them personally relevant to your life, your interests, or someone you love. It will make everything a lot more intrinsically rewarding while you are doing it. Don’t settle for less than what you want, even though settling is easier, even though it feels safer and requires a lot less courage. Even though you’ll feel the pressure of being pushed through a system, there will be times when you will need to fight that funnel. Education can get in the way of learning and if that happens, you will need to advocate for yourself. Say no and try not to make promises you can’t keep. You’re not superhuman. You’re someone doing the best that you can in the circumstances you are in. And you’ll be much more satisfied with fewer well-done projects then many poorly done, half completed projects that let your teammates down. Be gentle with the prickly people. You don’t know what’s happening in their lives and don’t know how they’ve been hurt. Assume their behavior is due to their circumstance and not to their whole person. Listen to good music that will sustain you. If you have a chance to work in a 39-room, beautiful, mysterious, and possibly haunted mansion, next to the biggest freshwater lake in world, how could you not? Working at Glensheen Historic Estate was one of my favorite parts of my undergraduate years. Admit your mistakes and appreciate the people that have contributed to your successes. Most importantly, I hope you fall deeply in love with the beautiful city of Duluth. I hope that you become integrated into the Duluth community, know the issues, vote in elections, learn the history, hear the local bands, and hike the trails. I hope you take the time to find your favorite hidden places. Climb uphill and see the city in the Fall during the hawk migration, find a spot near a waterfall to swim in the Summer, find a cozy coffee shop downtown to hunker down in during the winter and go down to the lake and listen to the ice cracking in the Spring. I promise it will make you treasure your time here that much more. Thank you readers, I wish you the absolute best in your future endeavors! Sometimes creativity comes in exciting spurts, with long in-betweens of staring at a blank canvas or sleeping on our computer keyboard. Moments of inspiration are exhilarating, but the creative process can be wrought with anxiety and therefore takes bravery and endurance. 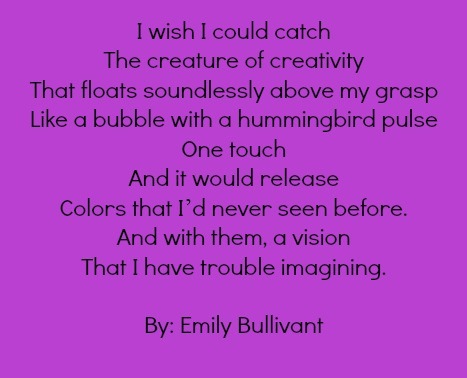 Everyone has the capacity to think creatively. If we are a sum of our life experiences that have shaped us from birth, our perspective is unique. If this is the case, then you have something to share that no one else can offer. Art can be a way to share these viewpoints. Art can also help us see life through a variety of different lenses and wrestle with multiple truths that are sometimes conflicting. If you are currently an undergraduate artist, actress, designer, director, dancer, choreographer, writer, musician, graphic designer, or photographer you are probably working on mastering your craft as well as building your portfolio. As I have taken classes in digital, applied, and performing arts, I’ve been collecting mantras that have changed how I viewed the creative process. These gems of advice from other artists sum up my four years as an SFA student as well as include some recent advice given by speaker Jonah Lehrer at the Sieur Du Luht Creativity Conference. Work begets work / Learn by doing. Do. Experiment. Play. Be messy. Break the rules. As you create, ideas will come more easily. Remember that moments of creative lucidity or “aha” moments can be few and far between. The work is difficult and scary, but when you start, it might take you in a direction you did not expect. Don’t cheat yourself out of realizing your full potential. Many of us have been trained to cut corners in school. We do only what is absolutely necessary to get by, but by not taking time to do the best work you can do, you are only letting yourself down. There is no way to unlock your potential if you do not push yourself. At the end of the day, you are going to want a portfolio of work you are proud of. And it will matter much more than a good grade. Take advantage of opportunities to collaborate. Collaboration can stimulate truly fantastic work. Teaming up with others can reveal blind spots that you were unaware of in your own work. Problems that you were having difficulty solving on your own, can suddenly work themselves out of a tangle. As new voices with a unified sense of purpose and aesthetic are added to the mix, the work can become richer- like overtones in a piece of choral music. Expose yourself to new experiences & learn everything that interests you. You put out what you take in. The more you take in, the more you have to draw from. Learn from your predecessors and masters of your craft. You have more artistic freedom than many of the greats, more freedom than Michelangelo and Raphael. You also have more artistic freedom in this country than many other places in the world. And in a university setting, you are protected from certain pressures and criticism that exists in the “real world”. These are the perfect conditions to see how far you can fly, so don’t hold back now. And at the end of the day, get back up. Sometimes you have an image in your mind, but when it comes to implementation, nothing you do can quite reach your ideals. You take a risk and make your art and some people criticize what feels like an extension of yourself. You compete for a grant, or try to get published, or pitch a show to a producer, or submit a film to a festival and you get rejected. Van Gogh was rejected countless times and never sold a painting in his life. So you take the fall, you feel vulnerable and injured. And you get back up, because failing isn’t actually failing in the arts. It’s an integral part of the creative process. This school year I had the opportunity to attend the Minnesota Council of Nonprofits Conference in October and I noticed they were offering a workshop on the integration of millennials into the workforce. This workshop was called, “Boomers vs. Millennials: How to Address Different Leadership Styles” and was led by Reid Zimmerman, Brooke Thomson and Mary Halet. That got me thinking. Workplace cohesion has become increasingly important as job market trends reveal that employers are looking for individuals that can collaborate in a team structure. Workshops like the one at the MCN Conference show us that Baby Boomers and Generation X are having a conversation about the best ways to incorporate us. In fact, businesses concerned with this transition are conducting surveys to figure out patterns on the behaviors, values, and communication styles of our generation. Although our college curriculum has been incorporating more group projects and presentations to prepare us for this, do we know who we are and are we prepared to work alongside other generations? Who are we as Millennials? We are comfortable with technology and grew up with the Internet where information flows freely. We are less likely to view information as owned and might have a different idea of confidentiality. We are also known for being more distractible. We are more likely to celebrate diversity and accept people of different races, cultural backgrounds and sexual orientations and are also more aware of discrimination. We are less likely to identify with or have loyalty to a particular organization, political, or religious institution. We are therefore more likely to make negative online comments about our workplaces and have less intention of staying with a particular organization for longer than a year. We are more likely to witness misconduct and less likely to report it. Fresh out of college and found a professional position in your field? Congratulations! You are finally starting to feel like an adult, but keep in mind that to your parent’s generation, you look like the Biebster. You’ll have to earn the trust and respect of your colleagues and that comes from building good rapport. Depending on your workplace, you might struggle to be taken seriously or be viewed as a threat. Your lack of experience and beginner status does put you at a disadvantage. Start by being reliable, showing with your actions that you walk your talk. Make a habit out of asking for advice and listening. Be modest, kind and respectful. Share your ideas, but really practice listening and building off your other team member. Our generation is familiar with positive mentorship and playing games where everyone wins. We are use to our voice counting and receiving individual attention. While that might make us good team players, it might give you unrealistic expectations about the additional support you will receive at your work, especially when you are just starting out. You might begin to feel unsure of yourself. Stick in there. Just because people are not praising your hard work does not mean it is going unnoticed. People who have been working in an organization or in a position longer than you are an important resource. With their experience they have a better understanding of the full picture and of what ideas have and what haven’t worked in the past. Building on this information can help you find more success as a team. Avoid being dismissive of their valuable know-how, even if they remind you of your parents or seem hesitant to embrace the change that you are envisioning. If you are interested in learning more about this topic, you can access the Minnesota Council of Nonprofits Conference workshop presentation. There is a lot of conflicting career advice out there that puts certain types of motivation in right and wrong categories. The idea of following your dreams, for example, is often considered noble, but to pursue a job solely because it will make you a great deal of money might be viewed as the “wrong” motivation. The truth is, we are people with different personalities, backgrounds, values and needs. In the end, only you can determine whether or not you are being true to your own values. Who do you hope to provide for in the future? Some people’s primary concern is whether or not they will be able to provide for themselves. They know with personal financial security comes the freedom and independence they that need to feel happy. For people motivated by security, money might be seen as a way to provide for the people they love either in the present or future. This motivation is common among personality types that are considered “planners”. If you have a tendency to think about the future, a dislike for transition periods and uncertainty, and enjoy working in a structured setting with clear expectations, you might value security. What type of lifestyle are you hoping to obtain or sustain? Money opens doors and can be a way to achieve your dreams of traveling around the world, or starting up a business or going to the Olympics. Having a lot of money is tied not only to security, but also to status. If you are motivated by money, it might be important to you that you have nice things and are seen in a certain way. To some, working is a way to achieve a luxurious or comfortable lifestyle. Do you love what you are doing? This motivation type is more based on emotions and the present moment. People who pursue their passion are genuinely enjoying the process of getting where they’re going. Since it is emotion-based, this type of motivation is subject to change or expand depending on your experiences. Do you have something to prove to yourself or someone else? Some of the most amazing human feats were accomplished through competition. Competition is often tied to ego and even though it can push you to do your best work, it can also produce many emotional highs and lows. For instance, it may be difficult for you to find contentment if you are not the best or you don’t view yourself as “winning”. Are you doing what you’re doing because you’re afraid of judgment or uncertainty? If there were one type of motivation that I would consider “wrong,” it would be to make your future decisions out of fear or insecurities. Nobody wants to fail, but if your fear of failure or disappointing someone else renders you incapable of taking risks, you might not be living your life to it’s fullest potential. Do you want to make a difference? Whether you want to feel like your life has meaning and significance or whether you want to be a part of a collective effort to produce a better future, impact can be a strong motivating force. Although we are all looking for happiness in this lifetime, we all have different beliefs on how to find it. Depending your personality and values, you may disagree or identify with certain career advice. Just remember to take your own motivation into account when you are in the process of making life decisions and stick true to what you believe will be the most fulfilling.